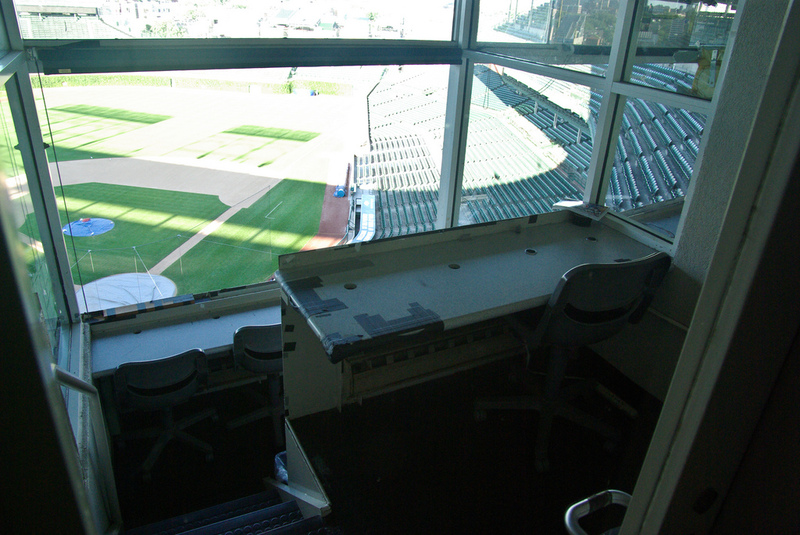 Today’s guest post written by national radio and TV sportscaster, John Fricke. Free advice is worth what you pay for it, unless it’s passed along from the likes of David Hill. When I was anchoring a Fox Sports Net there was a sign hanging, it had David’s name on it. It read like a sports media version of the Boy Scout motto. “Be Prepared, Stay Cool, Less is More”. I would write those initials down on the top page of any game notes I had “BP, SC, LIM”. There are truths in those words (for anyone, not just sportscasters). Nowhere is “Less is More” more critical than in play-by-play. One mistake I made early in my PBP days at Wake Forest was a tendency towards over-calling. The game, no matter how big, slows down for anyone calling it when they cease over-calling. Television is one thing — the pictures can paint the story (frankly announcers can end up getting in the way). On radio you need to paint the picture. As an example: In basketball there is absolutely no need to call every pass that’s made. Matter of fact there is little use in calling any pass unless it’s a great one that leads to a basket. The “Jones to Smith, back to Jones, he fires cross court to Johnson”. Please spare me. Using the time when teams are in half-court sets tossing it around to continually re-set the game is a far better, more effective option. “8:40 to go first half, State has the ball, leading by 3. State looking to go back inside where it has been effective in this game so far.” That is a much better way to call basketball than every single pass and screen and cut and…. Less is more. Another tendency that new broadcasters have is to overstate the importance of any single play. Unless it’s the final out of the World Series, odds are whatever just happened isn’t that big of a deal. It might be an ‘oh’ moment and that’s fine, but not everything is an ‘oh’ moment. There is a famous network sportscaster who, when he does play-by-play, makes everything it’s a huge deal. Any given two yard run on 2nd down in the early stages of the 2nd quarter of a tied regular season game is suddenly voiced as if it were a buzzer winning 70-yard field goal to claim the Super Bowl. It’s beyond annoying, it’s simply wrong to do. Understanding that games can be long events and that your audience is listening for the story to be told, slowing down and getting to a flow with the game is critical. Like the team playing, the announcer must stay cool. One time a famous network color announcer approached me 10 minutes before a game I was calling on radio. This star former coach asked me if I had a minute (I did not, but considering who he was I made the time) to tell him who was who on the two teams playing. He had no idea which player was which player. Sometimes it can be difficult to get down to the field or under the basket, before a game. But the smart thing to do is – whenever you are doing a game with at least one team that you have never seen before – is to do just that. At first shoot around for the other team, take your score sheet, walk under the basket and start at the top. #2 is Williams. Find him, note something about him, get a good look at him and move on. #5 is Thompson (same drill). #2 is Williams (spot him) #5 is Thompson. And so on. Through the whole roster, even the guys who don’t play much because, they just might in your game. Be prepared. Know the other guys by site BEFORE the tip. You won’t have to spend time looking down to reference who they are or to make a mistake in identifying them during play. And remember there is no law against hitting YouTube to watch highlights of coming opponents to see how they play and who the stars are. A request. Please NEVER SAY YOU’RE SORRY. If you make a mistake, don’t apologize. Simply issue a correction. Instead of “Sorry that foul was on Robins not Wesken” just say “Check that, credit the foul to Wesken”. You’re just correcting and clarifying the record, not trying to salve a wound you created. Listen to your tapes. Most of us, me included, don’t like to listen or watch ourselves. I had to get over that. Yes I was overly critical, but that’s the point. You need to know where your weaknesses are. You must work on your game and to work on it you have to know what you need to do better. Always ask for internal reviews from people you trust. Now understand their advice is what it’s worth, it’s free. Someone I trust once told me I had a bad problem not saying the score enough during Wake Forest football games. He was mad he had to wait for it. He was right. The score? It was 48-3 Georgia Tech. I really didn’t want to give it. John Fricke is a national radio and TV sportscaster. He has done Play-By-Play on TV and radio for Nebraska, Tennessee-Chattanooga, Wake Forest, San Diego State and The Mountain West Conference among others. Very good summation of the main points any aspiring sportscaster should learn immediately…the fundamentals. Notice he didn’t talk about “style”. That has to be personal and not copied from someone else. It will develop with experience. As with anything in life…Get the fundamentals down first. Jon’s advice is spot on. One more thing. Loud is not better, it’s just loud. Young Broadcasters think the Gus Johnson, Kevin Harlan style is the way to go. Loud not better. Kevin Harlan is really good on radio, not so much on TV. The biggest issue I have with young broadcasters is not paying their dues. Most think that right out of college they are going to work in the NFL, NBA or NHL tomorrow. Respect the process. Another problem i have respect the game. Too many homer broadcasters don’t respect the game for what it is and say things that are disparaging to the league and other teams. We are all trying to be promoters of the leagues we are in and the over the top homerism is a dis service to our profession. I hear more from higher levels that being respectful and calling it the way is supposed to be is more important that how badly you support your team. Just some thoughts from a guy who has been through this for a while.